· Pupil. Visible with the gonioscope if dilated. · Iris. Colour varies between individuals. · Ciliary body. Longditudinal muscle. Colur varies between individuals - may be pale brown, grey or dark. · Scleral spur. 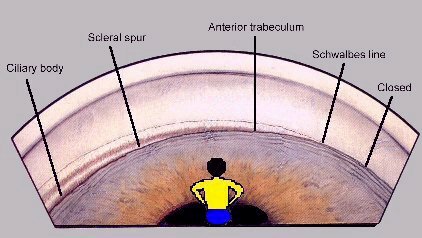 Protrusion of sclera into anterior chamber. Attached to ciliary body posteriorly and trabecular meshwork anteriorly. · Trabecular meshwork. Multilayered network of fenestrated lamellae and endothelial cells drainis aqueous into Canal of Schlemm which may visible when full of blood (e.g. in hypotony or when excess force applied to sclera during gonioscopy. Most of the drainage occurs via the posterior, more pigmented, portion of the trabecular meshwork. There are variations in colour but usually grey with varying degrees of pigmentation. · Schwalbe's line. Delineates the anterior edge of the trabecular zone and represents the termination of Descemet's membrane. Very fine glossy white line. · Posterior surface of Cornea. Observe limbal loops. · Iris processes. Normal variation. Fine bands of iris extending anteriorly to attach to ciliary body or scleral spur. · Peripheral anterior synechiae. Abnormal. May be associated with ICE (iridocorneal endothelial syndrome) or post argon laser trabeculoplasty. 1)	Slit lamp examination of the visible anterior segment structures and aqueous for aqueous flare and cells, posterior or anterior synechiae, iris hypoplasia, abnormal iris vessels or pigmentation, Krukenberg's spindle. · Place optical section just inside limbus. Assuming the corneal thickness = 1 unit, assess the width of the "aqueous gap" from corneal endothelium to iris. · The average adult eye has a chamber depth of 3.15 mm The chamber shallows by 0.01 mm per year. An eye with an anterior chamber depth of less than 2.5 mm is at risk for angle closure. · Using the central corneal thickness (approximately 0.5 mm) as a reference, estimate the depth of the chamber. · There are a number of grading systems. Estimation of the angle which the iris makes with the ciliary body/trabeculum.